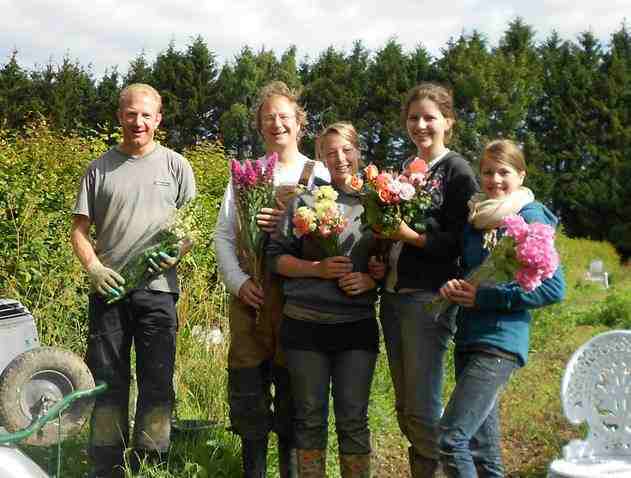 In the rolling hills of East Sussex there is an organic cut flower garden run by a passionate flower grower by the name of Arjen Huese. This gardener, originally from Holland, has flower growing in his genes – but where his compatriots in the Low Countries grow flowers on a large scale in huge heated greenhouses, Arjen has taken a different garden path and grows a wide variety of English flowers for flower shops in the region. Seven years ago Arjen fell in love with the English garden culture, but aghast at the sight of bucket after bucket of sterile imported industrial flowers at the florists, decided to grow real English scented flowers. Arjen doesn’t use any chemical fertilisers or pesticides, everything is grown organically and the result are robust flowers with character as well as a long vase life. 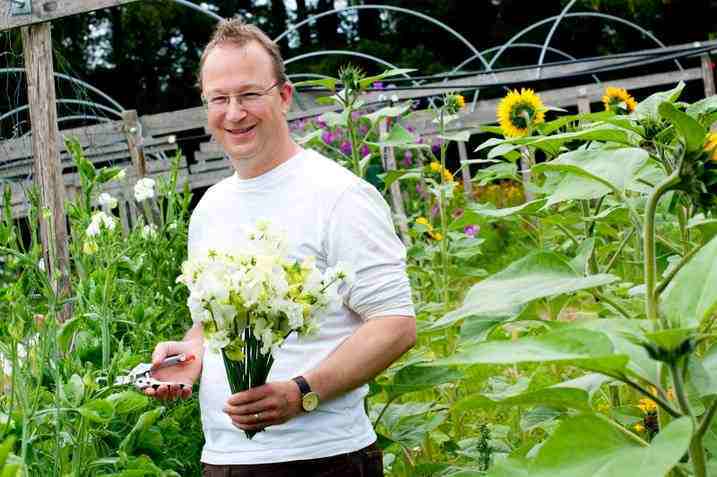 For several years now, Arjen has been teaching short, one-day courses in cut flower production. The first course is the Introduction to Cut Flower Production course in which Arjen covers all the basic topics you need to address when you are thinking about growing cut flowers: crops, varieties, suppliers, growing techniques, marketing basics, and many practical tips and tricks. 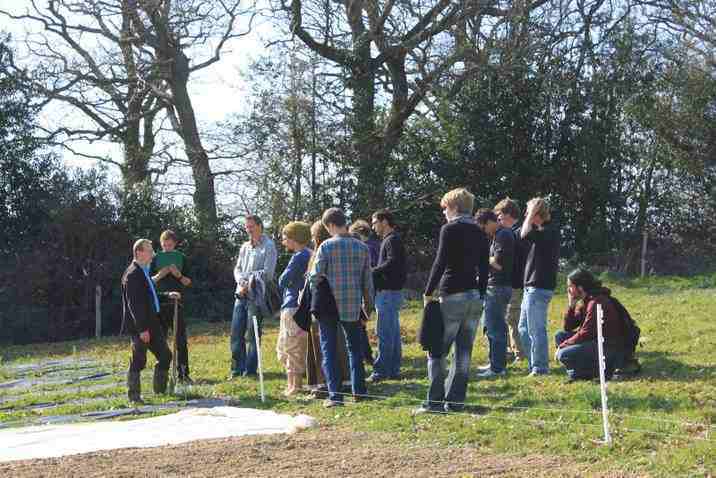 The second course focusses specifically on the planning aspects of cut flower growing: how can you make sure that you have a continuous supply of a wide range of flowers, fillers and foliage – either to make your own bouquets for a market or to have a broad catalogue of flowers for local flower shops and wedding florists. This course is highly recommended if you are seriously planning to start growing flowers. There are further courses on cut flower plant propagation and cut flower harvest and post-harvest handling. “Arjen, my marketing is going well, yes, and that is in no small part due to you, your enthusiasm for growing cut flowers for the British market, and the confidence i gained from that day. I came away really feeling that this was something i really COULD make work. Some Germination Times. How To Germinate Nicotiana Seeds. Iv been trying to email your farm as am after a bit of information about supply, but cant find valid email, could you please email me so I can get in contact? I also attended Arjen’s course and was so impressed I have booked on the other ones. Thanks for letting us know Ben, I have told Arjen that he should send you some commision. Hi Ben, I attended Arjen’s Introduction to Cut Flower Production course today and it was brilliantly inspiring and packed with So much info – fab day!